Daryl Johnson (Worcester Park, United Kingdom) on 24 May 2007 in Transportation and Portfolio. This is what you can see from the park in the previous two days' shots. This shinkansen (bullet train) is a 'Nozomi Super Express' if I remember rightly, on its way down to Hakata. I've never been inside one but I will one day. Love you shot. Great perspective and sense of motion! Shinkansen! How I miss taking that! The last time I took it was back in 2001! @Ee-Yuing: Its good isn't it? I like this one. Although there are many details in this picture it is well balanced. sat in one of those before! good capture you have there! love the cool blue on white! @DTW: It is. Cheers DTW! I like the perspective, Nice shot! I love the top part of the picture as the perspective moves away, it's really cool. Nice job! A carefully composed image! I like. Absolutely awesome shot D! Love what you've done with the colour, the composition and the way it fills the frame. Excellent work. Sorry I've not been around much. Just back from a 9 day trip back to Scotland and trying to catch up. @Stu: Thanks Stu. Hope you had a good time. Got to ride the Shinkansen between Takasaki and Nagano over the GW holidays. Must have been the first time in close to twenty years. I had forgotten just how blasted fast they seem from the inside. You did well to get that picture. Do they not have everything blocked off with chain link fence where you are? @Mike Cash: Thanks Mike. Took this through the fence, from the location in the previous 2 days' shots. Had to do a bit of cropping to tidy it up, lens wouldn't quite fit through the links! 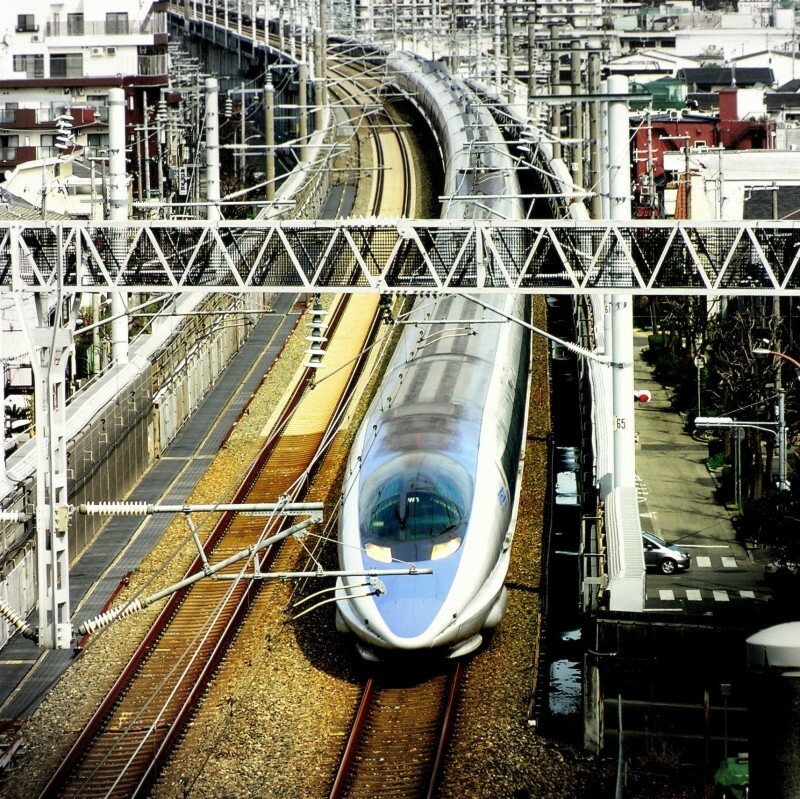 Are you excited about the new shinkansen about to make its debut...? @Alfredo J. Martiz J.: Thanks Alfredo! All my friends that have been to Japan said that this ride is a must!! @David: It is! Thanks David. wouaw, superbes, ces lignes !